What does claim your voice mean? It is Saying YES to your voice in all its forms. It means honoring your voice, allowing its perfections and imperfections and being grateful for its unique qualities. And finally it means you have confidence with what shows up and trust what it offers you. This happened to me at my first open mic 22 years ago. I was so freakin nervous but my friend dragged me to the stage and there I was in front of everyone literally shaking and sweating. I decided to proceed and 3 songs later (which I didn’t think were ‘real songs’) something happened. I ignited a soul calling. I claimed my voice that night and began a 22year journey of using my voice to monitor my spiritual evolution and soul songwriting. Your voice is a vehicle for personal growth that can lead to trust, confidence, allowance and deep healing! Soul Songwriting is a practice that gives your voice a path to discover areas in your body and psyche that are craving to be freed, expressed and updated. Here are 4 steps to use in a daily or weekly practice that will give you an amazing awareness of what is next! Quieting that rational mind with all its points of views is the first step. If this is not done proceeding is challenging, as it is hard to use your voice with the peanut gallery in my mind applauding or snickering at each sound you make. A simple way to quiet your mind is to notice your inhale and exhale. As you inhale say to yourself ‘SO’. On the exhale say to your self ‘HUM’. Focusing on the breath and these inner sounds helps to quiet the mind. If you are Reiki 2 certified you can use the Mental /Emotional symbol as well. Now release any tension in the body so your vocal instrument feels free to move all its parts. Connecting with the body will also give you information you may sound out later. A way to release the body is to do a Yogic Sun Salutation. If you have body challenges. The Sun Salutation can be modified. After releasing the body be still in the silence. Continue your So Hum breathing. Then engage the silence with this question,“Soul, What do you have to say to me?” Have a pen and paper and begin writing with reckless abandon in a stream of consciousness style. Go back after your done writing and see if there is a word or phrase that jumps out at you? Underline or highlight them. Now what ever you highlighted sing those words out. Don’t try to make it sing songy. Just with out trying, open your mouth and invite sound to come out with the intension of voicing your words. 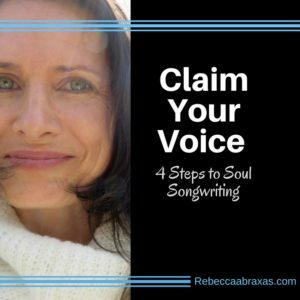 Soul Song writing to claim your voice . I wonder what will show up for you? I wonder what awareness will be activated? I wonder if your soul calling will be ignited? Oo it is so exciting ! 4 Steps to Get Free From Self Sabotage What’s Before Emotions? Let’s make life more easeful!